Art in Mongolia began with the impressions and expressions of feelings on rock. Ancient petroglyphs created before recorded history, and later, various Shaman symbols and sacred place identifications, bring us the voices and visions of the ancestors. These works usually depict hunting trophies and domesticated livestock, and more rarely, people and even carts with wheels. The oldest examples of rock painting in Mongolia are located at Khoit-Tsenkher Cave in Hovd Aimag. Painted in ochre on cave walls, these Stone Age paintings depict mammoths, sheep and ostriches. Later, cave paintings from the Bronze Age show animals, hunting scenes, carriages and various symbols. There is no perspective in the paintings. Regardless of distance, everything is shown in the same proportion. Rock and cave paintings are, however, not the only important Mongolian early artwork. The earliest examples of monumental sculpture known, not only in Mongolia, but in Central Asia in general, are deer stones. Considered by some to be the only genuine monument produced by nomadic art, deer stones are generally made from grey granite or marble and measure between two and five metres in height. Related to the religion of Shamanism, they are thought to mark the graves of important kings or warriors and are often located in groups of five or more. Altogether around 550 deer stones have been found in Mongolia and around 200 in the Eurasian countries surrounding it. The deer stone can be divided into three sections representing the three worlds of ancient Central Asian mythology: the sky, earth and the underworld. The top part of the stone shows the sun and the moon, representing the sky; the center shows a deer or other hoofed animal representing the world of the living whereas the bottom part shows bows and arrows, swords and sometimes deities representing the underworld. The deer, which is usually represented in silhouette with a long snout is an important symbol for Mongolians, and is believed to be able to carry the spirit of the dead to the next life. The other major type of monument found in Mongolia dates to the Turkish Empire between the 6th and 8th century AD. These human monuments are placed at graves facing the direction of the sun. The figures may be shown seated or standing, and are usually holding rituals cups against their chests, a symbol that they are participating in their own funerary banquet. In front of the statue there are usually a number of uncarved stone blocks, known as balbal. These may represent the number of enemies defeated by the buried hero. Another example of very sophisticated workmanship and artistic abilities of early Mongolians are the ancient relics found in at the Hunnu tombs of "Noyon Uul" which date back to between 1AD and 3BC. Jewellery, pottery and other early artwork have been found here but the most well regarded piece is a felt carpet which dates back around 2,000 years. The carpet shows a scene depicting a predator attacking an elk. The genre and style of the work is reminiscent of classic Greco-Scythian art, although it is a real Mongol folk art creation, since it is a piece of everyday practical utility. 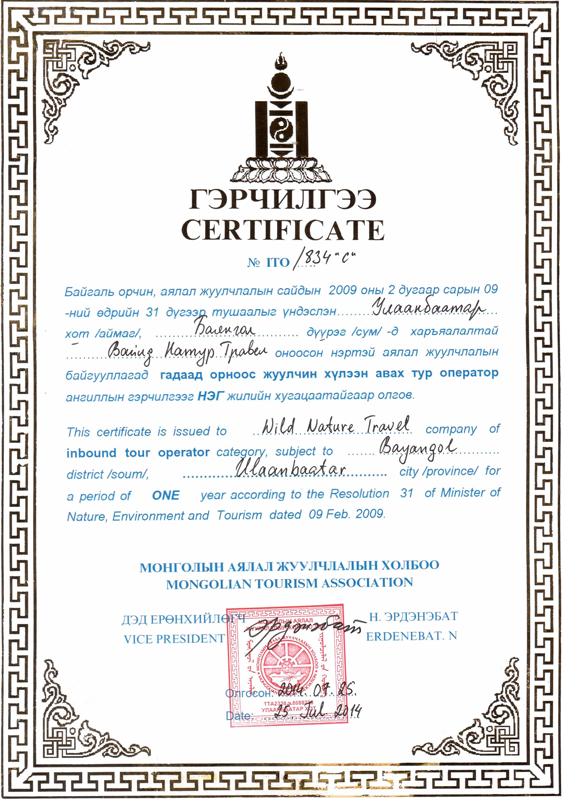 The technique of design is genuine Mongolian handwork style. Even though Mongolians have traditionally been a nomadic people, there is a long history of permanent settlements in Mongolia. One of the first of these is the city of Khar Balgas which was the capital of the Uighur Empire between the 8th and the 10th century AD. Built on the Orhon River, the city had streets and separate commercial and residential areas and a number of different religions including Christianity and Buddhism. Its ruins can still be seen today. The Kidan Empire, which developed soon after the fall of the Uighurs, brought about a period of urbanization in Mongolia. A network of cities (156 in total) was developed along the trade route, and traces of Buddhist temples and frescoes have been found in the remains of these settlements. Later, during the empire of Chinggis Khan in the 12th century, the great capital of Karakorum was established. The French monk William Rubruck (ca. 1210-ca. 1270) had the distinction of being the first European to visit the Mongol capital on the Orhon River to return and write about it. Rubruck had decided to undertake a mission to the Mongols primarily in the hope of converting them to Christianity. His roundtrip journey lasted the better part of three years. William described Karakorum: "In the Saracen quarter there was a market and many streets. In the Chinese quarter lived the craftsmen. Besides there were people of various nationalities, religion and faith, and twelve idol temples of different nations. In the outskirts of the city there were two mosques of Islam and one Christian church." It seems that during that time, the Christian religion was preached in a Nestorian version of doctrine. Thousands of years of nomadic life and the destruction of Mongolia's Buddhist monasteries in the 1930s have greatly limited the survival of pre-twentieth century Mongolian visual art. Still, the earliest examples of Mongolian painting, petroglyphs, date to more than two thousand years ago. Significant paintings also remain from the Uighur people, who lived in the 8th century. In fact, although Buddhism was present during the Uighur and Kidan empires, as well as being the religion of choice of Chinggis Khan's grandson, Khubilai Khan, it wasn't accepted as a state religion until a meeting with Avtai Khan and the leader of the Yellow Order of Buddhism from Tibet in 1578. 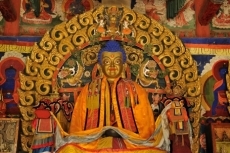 Around sixty years later the son of Gombodorj, the "Tusheet Khan", who was the grandson of legendary Avtai Sain Khan, was enthroned in 1639 as a theocratic monarch with the name Zanabazar. He contributed greatly to the history of the Mongols and was a pioneering role model in fine arts, especially sculpture. For more information on the sculpture of Zanabazar. For centuries after the adoption of Buddhism in Mongolia, Buddhist-related art was the predominate form of art created in this country. There was at that time a whole network of locations in medieval Mongolia where professional craftsmen were trained. The work of artists, who were generally also monks, was used as objects of worship. The most common media in religious art were mineral pigments on cloth and appliquй (pieces of cloth stitched together and embroidered to form an image.) Applique was especially suited to Mongolian life, as it was easy to transport and held up well in the dry climate, as opposed to paintings, which might be damaged by the climate and the wear and tear of frequent rolling and unrolling. In addition, many monasteries were engaged in printing sutras and religious texts by woodblock. The most famous among them were Ikh Khuree, Zaya Khuree, Ikh Tamir Khuree, Bereeven Khiyd monastery complex. Generally, artists were also monks (lamas), and the actual creative process was also a spiritual one. Both art and architecture from this period draw heavily from Tibetan and Chinese traditions, with some specifically Mongolian elements woven in. Indeed, the architecture of monasteries in Mongolia is particularly interesting. This architecture was influenced by Chinese and Tibetan styles but many monasteries also reflect the traditional architecture of the ger. These temples are built with the same basic framework as a ger, with the felt covering replaced with wood or stone, and the windows or shutters located at the top of the walls. There are also Tibetan style complexes, like the Erdene Zuu compound, which was erected on the ruins of Karakorum. At this unique site, visitors are able to enjoy the ancient architectural and fine arts in one. Currently in Erdene Zuu monastery compound there are 11 monasteries. Zanabazar was assassinated by the Manchu Emperor in 1723 and Amarbaysgalant monastery was erected in Selenge aimag on Iyven river in memory of him. This monastery is another unique site representing an important stage of architectural art development in Mongolia. The complex is laid out on a north-south axis and the buildings are Chinese in style, but the roof structures are not like anthing else found in China or Mongolia. In temples throughout Mongolia, the art relates to the gods and devils of Buddhism. Often Buddhist dieties are presented in a form of icon portraits, with surrounding accessories and symbols, painted with pigments on paper or cloth. There are also appliquй pieces, which involve embroidery and sewing of various cut silk details onto a background silk. Another fine example of Buddhist art is the Undur Janraiseg statue located in Gandan monastery in Ulaanbaatar which was constructed in praise of prosperity of the 8th Bogdo Javzandamba Khutagt, the theological monarch and was devoted to Aryabal Burkhan, one of Gods in Buddhism. In Buddhist art, the masks of the Tsam ritual dance were also one of the main artistic streams. These masks were created in 17th and 18th centuries by the master team headed by Puntsag-Osor and formed the basis of traditional Tsam ceremonies held on special days throughout the year. With the support of the Soviets, the People's Republic of Mongolia was established in 1924, and in this year B. Sharav painted a portrait of Lenin. This adaptability of Sharav's illustrates a huge shift in Mongolian art: works created during the period under Socialism were dedicated to publicizing the new system. In the 1930s, Stalinist purges destroyed most monasteries and killed many monks in Mongolia. Also, in the early 20th century, a new aesthetic was introduced, as Mongolian artists were exposed to Western-style oil painting. In order to develop Mongolian art systematically, specialized artists were trained and specialized agencies were established in Mongolia. In the 1940s, the Mongolian government began sponsoring art students' travel and study in the Soviet Union. During this time, Socialist Realism and 19th century Impressionist styles dominated art produced by Mongolians. In the 1950s many genres of fine art, carpet and porcelain production were introduced in Mongolia and developed. During this period many artists and architects became very famous for their thematic work, namely, painter O. Tsevegjav for animals (photo 6), U.Yadamsuren for workers, N.Tsultem and G.Odon for history and everyday life, L.Gavaa for nature, and architect S.Choimbol for monuments. Literature. Since the Mongols were always highly mobile, most art forms that became popular were portable and involved little or no equipment, such as epic poetry, literature, music, and dance. 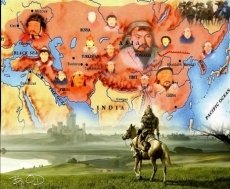 The most famous epic poem of all time is "The Secret History of the Mongols," a long poem describing Genghis Khan's rise to power and the creation of the Mongol Empire. This poem was written down in the mid- to late-13th century and was supposed to be hidden from non-Mongols. Folktales also played a major role in oral literature and their subject matter ranged from love to heroism to supernatural acts. Modern literature has been heavily influenced by Western literary styles, especially Russian literature. Graphic Arts. The nature and types of graphic arts found in Mongolia were also influenced by the nomadic heritage. Articles of daily use including saddles, horse blankets, storage chests, and knives were often highly decorative. Painting and sculpture could be found in permanent buildings, such as temples, throughout the country. Religious themes dominated traditional painting and sculpture because these art forms were largely produced within Lamaist temples. The Museum of Fine Arts in Ulaanbaatar has an extensive collection of Lamaistic paintings, sculpture, and other religious objects from different periods. Scroll paintings called tanka that depicted the various gods and saints of Lamaist Buddhism decorated every temple. These paintings were both imported from Tibet and created locally by lamas. Tanka came in a variety of sizes and were often painted on cotton or silk. In the post-socialist period, it has become increasingly popular for Mongol families to own tanka and display them in their homes. Under socialism, local artists produced their own substantial body of Soviet-encouraged socialist art, which is less in favor today. Performance Arts. Performing arts have been widely practiced in Mongolia for centuries. Today there are many professional and amateur theaters and musical organizations both in the capital and in other provincial towns. In both the socialist and post-socialist eras, the government has been supportive of performing arts and has subsidized traveling shows of operas, plays, ballets, folk music and dancing, and circuses. The most important folk instrument is the morin khuur (horse-head fiddle), a stringed instrument whose name comes from the horse head carved above the tuning pegs. The morin khuur has a trapezoid-shaped body, leather sounding board, and two strings that are played with a bow made of wood and horsehair. Playing from a seated position, the musician rests the morin khuur on his knee. In many areas of the country, men were traditionally expected to know how to play the morin khuur. It is often played together with the tovshuur and the shudraga (two banjo-like stringed instruments). Other instruments used in folk music include transverse and vertical flutes, drums, cymbals, gongs, and tambourines. Like poetry, vocal music is very important in this culture and there are multiple types of folk songs. Herding songs and work songs are most typical and these songs can have specific purposes (e.g., a herding song to call back animals that have strayed or a work song sung while setting up camp). Other types of folk songs include yurol (songs of blessing), magtaal (songs of praise), urtyn duu ("long songs" performed by professional singers with operatic training), and khoomei (harmonic singing in which one performer combines humming and whistling to sound like several people singing at once). In the post-socialist era, the country's youth have embraced Western music and there are quite a few nightclubs in the major cities where one can dance to the same pop music topping the charts in the United States, Europe, and elsewhere in Asia. A growing number of local rock groups are now performing whose music is mainly sold in Mongolia but can also sometimes be found in other Asian countries. Morin Khur, or horse-head fiddle is a Mongolian national musical instrument. Up to 1990s the instrument was mainly used to perform national melodies which imitate animals' and nature's appearance and behavior, especially the horse. Nowadays, it is also used to perform world classical melodies. Many of the Mongolian and foreign spectators are impressed and delighted about the instrument's potential. Morin Khur which represents the greatest symbol of national musical instruments was created by the nomadic Mongolians, and it is registered into the world cultural heritage. A new player of Morin Khur, first of all, learns to imitate the amble gait of a horse. This shows that the horse-head fiddle is inseparable from the Mongolians and their horses. The horse has been the pride of Mongolian cavalrymen, and the mainstay of their unity. Long song is a unique traditional singing style known as Urtiin duu. Its miracle is unrepeatable elsewhere. A herder taking herds to pasture sings a song which involves extraordinarily complicated, drawn-out vocal sounds. It is evocative of the boundless steppe. While the people from other countries live in relevancy of each other, the Mongolians are comparatively independent people. This specific of life is formed into majestic profound songs, demanding great skill and the breathing abilities. Long songs are produced in the depth of people's real life, that is why there is no author and composer. They represent one of the oldest genres of Mongolian musical art, dating to the 13th century. The Khuumii involves producing two simultaneous tones with the human voice. It is a difficult skill requiring special ways of breathing. One tone comes out as a whistle-like sound, the result of locked breath in the chest being forced out through the throat in a specific way, while a lower tone sounds as a base. The Khuumii is considered musical art -not exactly singing, but using one's throat as an instrument. It doesn't occur in other national cultures. 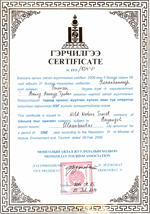 Bielge is particular to the people of western Mongolia. The dancers make practically no use of their feet. Instead, the dancers use only the upper part of their bodies. There are more than ten types of Bielge distinguishable by the movement of arms, especially shoulders, wrist and fingers. 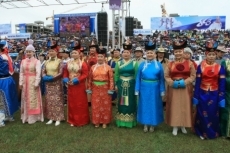 Mongolians perform Bielge since childhood. In olden days the herding neighbors used to get together in their ger to have a fun of dancing Bielge. This way the traditional manner of performing Bielge has been handed down from generation to generation and reached the present time in a somewhat modified form. This ancient genre, enriched by generations, combines poetry, songs, music and the individuality of each performer. Singers may sing with or without a musical instrument. 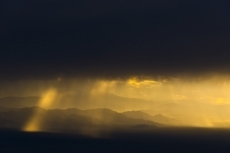 These sung stories are told from memory and may have thousands of quatrains. Such long stories are usually performed on a long winter night. By combining stories, music and drama, herders organize a kind of home school. The children, while playing various collective games with bone and wooden toys, listen to the songs and learn about history, life and folklore. "Geser", "Jangar", "Khan Kharakhui", and "Bum Erdene" are classic legend and story songs. Each is a library of folk wisdom and national heritage. The 1960s and 70s saw two interesting trends in Mongolian art. One is that after decades of almost solely working in Soviet and early-Russian styles, some Mongolian artists began to incorporate the older Mongolian aesthetic into their pieces, which remained Socialist in tone. Thus, for example, one finds stylized flowers, clouds, and rivers surrounding the Mongolian seal and all the ethnic groups; or, an idyllic Socialist scene very reminiscent of Sharav's "One Day in Mongolia. "Also, the technique of applique resurfaced, especially in the mid-1960s when the government commissioned a number of applique works to celebrate the 40th anniversary of the Revolution. A second trend during these decades and beyond was that Mongolians began to look outside the Soviet Union for influences to Eastern Europe. Their work began to show more individualism: artists began refusing to use realism, linear perspectives, and harmonization of colors, and explored other techniques of painting. However, throughout these decades, the government kept a close eye on art, and was known to close exhibitions, punish artists with fines, and denounce abstract work as bourgeois. One banned piece was "The Mother's Love," by O. Tsevegjav, painted in 1968. In 1990, Mongolia changed to a multi-party system and market-based economy. This meant both positive and negative influences on the art world. With the change in the economy, inflation and supply shortages caused widespread poverty, and the Socialist system's support of the arts collapsed. But it also meant the beginning of the revival of Buddhism, and freedom for artists to express themselves without restrictions on subject matter or style.